The latest version of .NET Core is out, and it's packed with a bunch of great new features of developers. Let's take a tour, shall we? .NET Core 2.1 was officially released on May 30. I will summarize what’s new for all its parts – .NET Core itself, Entity Framework Core, and ASP.NET Core. You can also check out our article on the .NET Ecosystem to fully understand your options before you start your next project. First, you will need either Visual Studio 2017 15.7 (or higher), Visual Studio Code, or Visual Studio for Mac in order to fully leverage this version. Docker images have been published at the Microsoft Docker repo. It is important that you upgrade since .NET Core 2.0 will reach end of life for Microsoft support in October 2018. There are no breaking changes, only a couple of useful additions. You can specify an installation path, but that will, most likely, be rarely used. There is no base class or whatever, a global tool is just a program with a Main method that runs. Do remember, though, that global tools are usually added to your path and run in full trust. Please do not install .NET Core global tools unless you trust the author! Finally, the watch, dev-certs, user-secrets, sql-cache, and ef tools have been converted to global tools, so you will no longer need to use DotNetCliReferenceTool in your .csproj file. I bet this will be handy for you Entity Framework Core migrations users! Image taken from https://blogs.msdn.microsoft.com/dotnet/2018/05/30/announcing-net-core-2-1, please refer to this page to learn about the actual details. Devirtualization, where the JIT compiler is able to statically determine the target for virtual method invocations; this affects collections a lot. Optimization of boxing, avoiding, in some cases, allocating objects in the heap at all. Reducing lock contention in the case of low-level threading primitives, and also the number of allocations. Reducing allocations by introducing new APIs that don’t need them such as Span<T> and Memory<T>, and changing existing APIs to support these; the String class, for example, yields much better performance in typical scenarios. Networking was also optimized, both low-level (IPAddress) and high-level (HttpClient); some of the improvements also had to do with reducing allocations. Operating system-specific operations, such as Guide generation. In general, the Just In Time (JIT) compiler is much smarter now and can optimize common scenarios, and a new set of APIs provides much more efficient resource usage than before, mostly by reducing allocations. These classes are used to represent contiguous memory chunks, without copying them. By contiguous memory, I mean arrays, pointers to unmanaged memory or stack-allocated memory. Classes such as String, Stream and others now offer methods that work with these new types in a more efficient way, without making copies, and allowing the slicing of it. The difference between Span<T> and Memory<T> is that the former needs to be declared on the stack (in a struct), but not the contents it points to (of course!). Neither of these calls (creation of Span<T> or ReadOnlySpan<T>) allocates any memory on the heap. Both these types have cast operators to and from arrays of generic types, so they can be directly assigned and converted. This is the first NoSQL provider for EF Core that is made available by Microsoft. Though it's still in preview, you can already use it in most cases, to access your CosmosDB (formerly Azure DocumentDB) databases. Mind you, this will work, but on the client-side, meaning, EF will bring all the data into the client and then perform the grouping in memory – not something you would generally want! This is useful if you wish to have read-only properties, for example. Notice how we need to supply both direction conversions – the ToString() call in the HasConversion is the value to store in the database and the Enum.Parse is to convert the value from the database. You can pass any number of parameters in the HasData call. Think of an owned entity as a value type in Domain Driven Design terminology. It is similar to an entity but does not have an id and you can declare properties of owned entities, thereby making reuse easier. The syntax is a bit awkward, but it works! SignalR has finally been released for ASP.NET Core. In case you don’t know about it, it’s a real-time library that permits communication from the server to the client and it works in almost any browser out there, including mobile ones. Try it to believe it! It is now possible to deploy .cshtml files in assemblies, which means it can also be deployed to NuGet. This is very handy and is the basis for the next feature. Razor Pages, introduced in version 2.0, now supports areas and shared folders. Essentially it is a new syntax to render partial views. The ASP.NET Core Identity library for authentication brings along its own user interface, which, starting with ASP.NET Core 2.1, is deployed on the same NuGet package as included .cshtml files. What this means is that you can select the parts you want, and provide your own UI for the others. Visual Studio 2017 now knows about this and will guide you through the process, when you add support for Identity. You can now mix different authentication providers, like bearer tokens and cookies, in the same app, very easily. Virtual here means that you can specify a moniker name, and then deal with it in the exact way you want. What’s there to say? It’s here by default, together with HTTP, which you can now probably disable. This is actually pretty good as it forces you to use HTTPS from the start, thereby avoiding typical pitfalls that arrive at deployment to production time. For sites generated using the built-in template, a new GDPR-compliant cookie-consent message is displayed when one accesses the site for the first time. This message is configurable, of course. There’s also support for specifying cookies that are needed by the infrastructure and those that it can live without (this is an API change). There’s a NuGet package called Microsoft.AspNetCore.Mvc.Testing that contains the infrastructure classes to perform functional tests of your MVC apps. These tests are different from unit tests, for example, because you actually test your classes in pretty much the same way as if they were running in a web app, this includes filters, model binding, and all that. Now, this package was already available previously, but now you no longer need to write some boilerplate code to allow your tests to locate the view files. It relies on convention and some magic to automatically find these and makes your tests much simpler to write. Automatic model validation, using the registered validator (by default, using Data Annotations). [FromBody] will be the default for non-GET requests, for complex types, [FromRoute] and [FromQuery] will be used in sequence for any other parameters, and also [FromFile], if you have parameters of type IFormFile. ApiExplorer will know very early about your controllers, which means you can also apply conventions or otherwise make changes to them. Additionally, it is common for developers to just declare action methods as returning IActionResult, but unfortunately, this is quite opaque to OpenAPI, as it doesn’t say anything at all about what result we can expect from it. Now we have the ActionResult<T> type, which makes the use of the [Produces] attribute unnecessary. This class has a bit of magic, in particular, it does not implement IActionResult, but IConvertToActionResult instead. Don’t worry too much about it, it just works! A host is what runs your web app. In this version, a new HostBuilder class was introduced that allows you to configure the many aspects of your app, from the dependency injection, logging, and configuration provider, from the very start. This will make your Startup class much leaner. It will also allow non-HTTP scenarios because this is not tied to web/HTTP in any way. Before this, we had WebHostBuilder, and, as of now, we still do, but in the future, HostBuilder will eventually supersede it. New Angular, React and Redux templates are now available and GDPR-friendly. The ASP.NET Core module is what Internet Information Services (IIS) uses to process requests for .NET Core applications in Windows. Its performance has been improved roughly 6x as it runs .NET Core in-process, avoiding proxying. Its usage is transparent to the developer, and, of course, does not apply if you’re working with non-Windows operating systems. It’s as simple as updating the TargetFramework property of the .csproj files to contain netcoreapp2.1 instead of netcoreapp2.0 and replacing any references to Microsoft.AspNetCore.All for Microsoft.AspNetCore.App. It is also safe to remove any references to DotNetCliToolReference, as it was replaced by global tools. Of course, when Visual Studio asks you to update the NuGet packages of your solution, you should do it to use the latest features. This new version brings lots of interesting features to the .NET Core world. Entity Framework Core seems to be moving fast and will hopefully reach the level of maturity of pre-Core versions pretty soon. 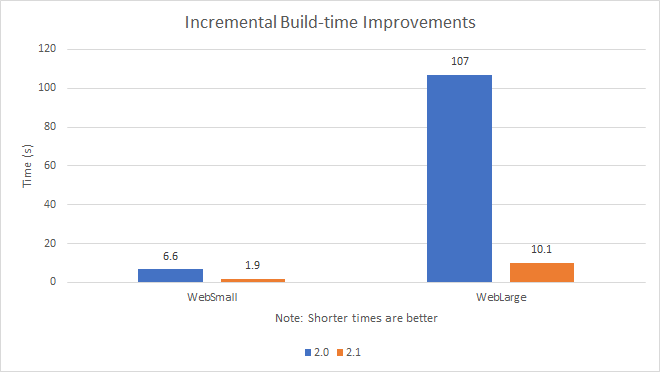 ASP.NET Core continues to include more and more features at a steady pace too. It is good to see Microsoft addressing performance in a very serious manner and the results seem most impressive. Published at DZone with permission of Ricardo Peres , DZone MVB. See the original article here.